XPlain Ltd is proud to be one of the sponsors for a one-day seminar: Performing Human Clinical Studies Using Medical Devices, on December 15, 2010 at the Dan Hotel in Tel Aviv 8:30-15:15. The seminar will cover topics such as how to conduct human studies in accordance with AMAR requirements, statistical aspects of clinical studies, the new EU MEDEV and how to submit a request for performing a clinical study involving a medical device. There is a nominal fee of NIS180 for attendance that will be donated to the community. Please stop in to visit us at our booth and learn about what we can offer you in the field of documentation of medical devices. This post is a continuation of our interview with Dr. Amnon Weichselbaum, who is the New Projects Manager for the Yozmot Haemek technological incubator. Q: What is the success rate of the incubator in getting funding for startups? A: The last 17 companies that we have proposed to the committee have been funded. Approximately 80% of the companies that completed two years in the incubator were funded by outside investors. Q: That’s pretty impressive. To what do you attribute your success? A: Through experience I’ve learned both what is likely to get funded and what will have a good chance of success. Q: Can you elaborate? What are you looking for? A: I look at the technology as well as at the personality of the entrepreneur. The project has to be practical in terms of novelty, potential market, IP and development timetable, but what is more important is the personality of the entrepreneur. The entrepreneur must be both realistic in terms of what is required for the successful development and commercializing of a product. At the same time, he must have great determination and fire in his eyes. Q: Can you quantify the traits that you are looking for? A: Actually I can. I presented a quantified method of determining the potential success of an idea and presented it at a lecture that I gave to students. But, in fact, there are more factors going through my head when I decide about a project, and I don’t literally quantify the process in “real life”. Q: Is there a problem with entrepreneurs coming from academia not being prepared for the business world? A: Sometimes people coming from academia have unrealistic expectations and don’t realize the importance of certain steps in product development, such as regulatory issues in the development of a medical device. Q: What is the main reason that incubator companies fail to get outside funding after two years? A: In my experience, projects generally don’t fail because of technological reasons but rather due to personality conflicts. Q: Who actually owns the companies? A: The companies are owned partly by the entrepreneur, partly by investors, and partly by the incubator. Q: Do you retain your shares after the company leaves the incubator? A: It depends. Sometimes we retain all our shares and sometimes we sell all or part of them at different stages in the development of the company, depending on our financial needs and the business opportunity. Q: That brings me to my next question. Who actually owns the incubator? A: We are the last incubator that is state-owned and we are now going through privatization, meaning that we will soon be self-sustaining. A: I think that it is good and bad. On the one hand we will be self-sustaining and not taking taxpayer money for the day to day activity and management of the incubator, but on the other hand we may not be able to take as many chances backing projects that may be a little more risky. As we described in our previous post, Israel has a vigorous technology incubator program. Starting with this post, we will highlight incubators located in Northern Israel. Today’s post features the Yozmot Haemek Incubator in Migdal Haemek. To learn more about the incubator we interviewed Dr. Amnon Weichselbaum who is the New Projects Manager for the incubator. In addition to his administrative position, Amnon brings a unique perspective to his work because he has also founded two companies in the incubator, one of which (Fertillegent) has already produced a commercialized product. What follows is a summary of our discussion. Q: If I am an entrepreneur living in the North I can choose from several incubators. How do I choose in which incubator I want to set up my company? A: I would advise you to visit the incubators that you are considering. How are the facilities? Do you feel good chemistry with the people there? What is their success rate in having projects approved? How many of their projects have gone on to be successful companies? In addition some incubators specialize in certain types of technologies. For instance, our incubator places an emphasis on medical device companies. Q: How does this help an entrepreneur who wishes to develop a medical device? A: We know the field. We know the process from a technological, IP and regulatory standpoint and also know investors who are interested in investing in medical devices. Q: What is the process that someone with an idea has to follow to set up a company in the incubator? They then send a representative to interview the entrepreneur and write an appraisal. We go with the entrepreneur to meet with a 12-member committee who decide on the spot whether or not to OK the project. If the project is approved the Chief Scientist provides $350,000 and the incubator and entrepreneur must provide an additional $100,000. This is meant to last for approximately two years. Q: What happens during those two years? A: Especially in the medical device field, it is unrealistic to expect a market-ready device to be developed in two years. However, we expect to see a fully developed prototype and Proof of Concept. The company should be at a stage where it is able to attract outside investors. Q: What does the incubator provide the entrepreneur? A: In general, our goal is to allow the entrepreneur concentrate on developing their idea from the technological as well as the business development point of view while we take care of all the rest. We provide a physical space, utilities, cleaning, bookkeeping, and secretarial services. In addition we can recommend subcontractors, put them in touch with investors, and are always available for providing advice. Q: What happens after two years? A: After approximately two years the company is expected to be able to attract outside investors and to move out of the incubator. In some cases additional funding can be provided by the Chief Scientist for an additional year within the framework of the incubator . If the company is not viable it closes. Q: Do you stay in touch with companies after they leave the incubator? A: Yes. We sit on the board of directors and retain our shares for a certain period after the company leaves the incubator. To view the second half of this two-part interview click here. We would all like to think that the water that comes out of our tap is safe to drink. However, with an expanding world population, pesticide runoff, pollution, and threats of terrorism, we cannot take the safety of our water supply for granted. Various methods have been developed to test for specific contaminants, but a good general qualitative test for the presence of contaminants has been lacking. 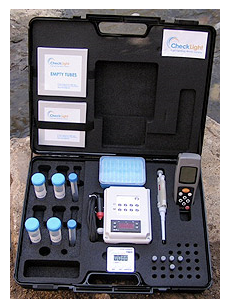 CheckLight Ltd (http://www.checklight.biz) located in Tivon, Israel has leveraged the power of luminescent bacteria to serve as a warning system for water contaminants. Basic research discoveries indicated that luminescent bacteria react to the presence of a wide range of contaminants in the water by changes in their luminescence. CheckLight has exploited this fact to produce portable kits and permanent stations for detecting the presence of water contaminants. Once the presence of a contaminant has been detected, additional testing can be performed to establish the identity of the specific contaminant. CheckLight was founded in 2001 by Dr. Nirit Ulitzur, whose father, Professor Shimon Ulitzur, performed the basic research that lead to the commercial use of the luminescent bacteria. Checklight was chosen by the Chinese Ministry of Environmental Protection to supply emergency water testing kits to the earthquake stricken region of Sichuan in 2008, and to protect the water supply for the Beijing Olympics in 2008. In early 2008 WhiteWater, a leading Israeli water technologies company, became a strategic investor in CheckLight. The possibilities and implications for this type of technology in both military and civilian applications are immense. On the military side a large number of these three types of devices communicating with each other and attacking an enemy not equipped with this technology would make for a very one-sided battle along the lines of tanks against bows and arrows. In addition, once these types of devices are deployed in large numbers, there will need to be a re-thinking about the role of some of today’s military technology. Just imagine 50 of these little boats, each equipped with a missile, attacking a large warship. Because of their small size and fast speed they would be very difficult to destroy before they could launch their missiles. On the civilian side all three types of devices could be used in life-saving applications such as search and rescue and replacing human operators in dangerous or unpleasant environments. We recently visited CI systems in the Ramat Gabriel industrial park in Migdal Haemek. CI was founded in 1978 and includes an Electro-Optics Test Systems division, a semiconductor division and a subsidiary in the electronic card assembly and inspection industry. Approximately half its sales are in the USA, with the rest in Israel, Europe and the Far East. 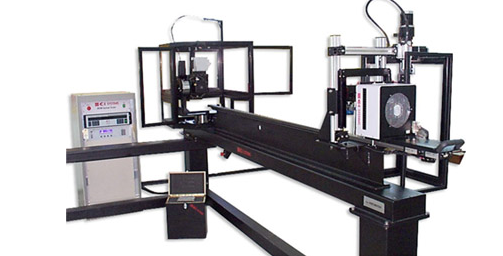 CI Systems is one of the leading companies in electro-optical testing, measurement and simulation. What does this mean? Say you have a system for detecting an incoming missile using infrared technology. How do you test whether the system really works? How do you train your crew? Firing off a missile every time you want to run a training session or test the system can get pretty expensive. This is where the simulator comes in. The simulator can simulate a variety of scenarios including varying the temperature, speed and size of the simulated missile. So what is a blackbody? In the world of physics a blackbody is a theoretical creation that is an ideal radiator and absorber of energy at all electromagnetic wavelengths. In the world of electro-optical testing and simulation it is a device that is capable of producing IR radiation at a variety of uniform and highly defined levels. Argo Medical Technologies located in the MATAM hi-tech park in Haifa was founded by Amit Gofer, one of the founders of Odin Technologies (Now part of Medtronics), after he was severely injured in a motorcycle accident and now uses a wheelchair. Argo’s first product is the ReWalk. As you can see in the clip the device is a computer-operated exoskeleton that moves the users legs while they support themselves using crutches. In its current configuration because the use of crutches is required the device can be used only by individuals who have movement in their upper body. Argo recently raised $3.1 million dollars in funding and following completion of clinical trials at Sheba hospital in Israel is now performing clinical trials in the USA.